The Pedra do Ovo is a natural rock formation which is egg shaped and has a huge fracture which divides the formation vertically. 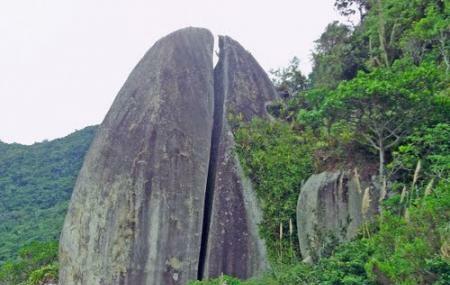 A rather interesting geological sight, the stone itself stands vertical and is as tall as the hill which surrounds it. However, the highlight remains the view of the other side facing the beautiful coastline of Balneario Camboriu. If you love to see quirky places which are a local highlight, don’t miss this place. Don’t forget to carry a camera to capture the view of the terrain-especially the coastline. How popular is Pedra Do Ovo? People normally club together Estaleirinho Beach and Praia Do Pinho while planning their visit to Pedra Do Ovo.